If you must err on one ball position for pitching it should be more back in your stance. Because if the golf ball is back in your stance it is easier to make contact because the clubhead is swinging down towards the golf ball. 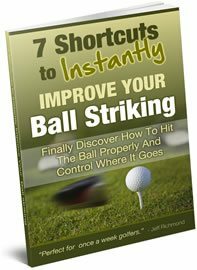 The further forward you move the golf ball in your stance the greater the risk of hitting the ball on the upswing and if you make contact on the upswing you will strike the middle or top of the golf ball and the result will be a low shot with flat trajectory. The lifting motion impacts trajectory and backspin, two key elements to pitching the golf ball softly around the green. 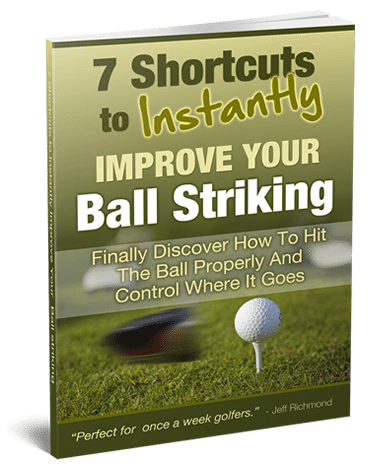 If you are struggling with pitching the golf ball, ball placement in your stance can play a major role in you getting back on the right track. I suggest you start with the ball in the center of your stance and you will be able to make good contact and see instant results. Keep in mind moving the ball forward in your stance will allow the golf ball to fly higher but it makes the pitch shot a bit more risky. That is ball position for a pitch shot covered. In the next pitching lesson we are going to be looking at where you should have your weight when hitting a pitch shot.